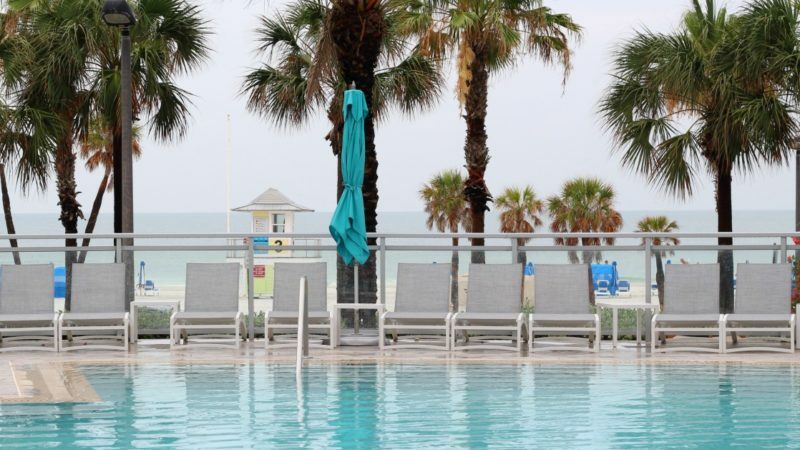 The pool overlooking the ocean is just one of many reasons to stay at the Wyndham Grand Clearwater Beach. 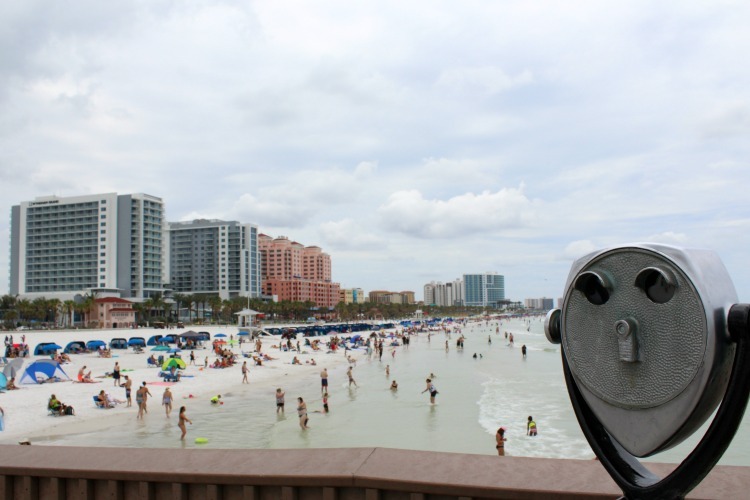 Are you planning a Clearwater Beach vacation? If so, why not do it in style? 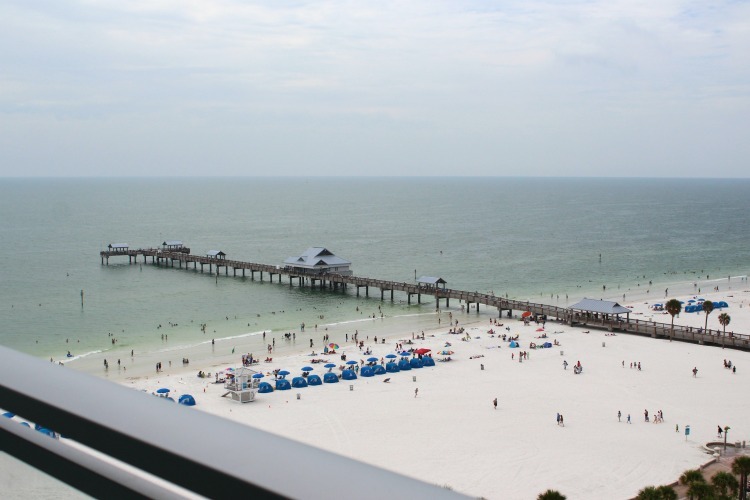 With a perfect location just across the street from the beach, a great selection of restaurants and attractions within walking distance, and a spectacular view that can’t be beat, the Wyndham Grand Clearwater Beach in Florida is definitely worth checking out. When even the alarm clocks have their own special features, you know it’s going to be good. I love a beach getaway! 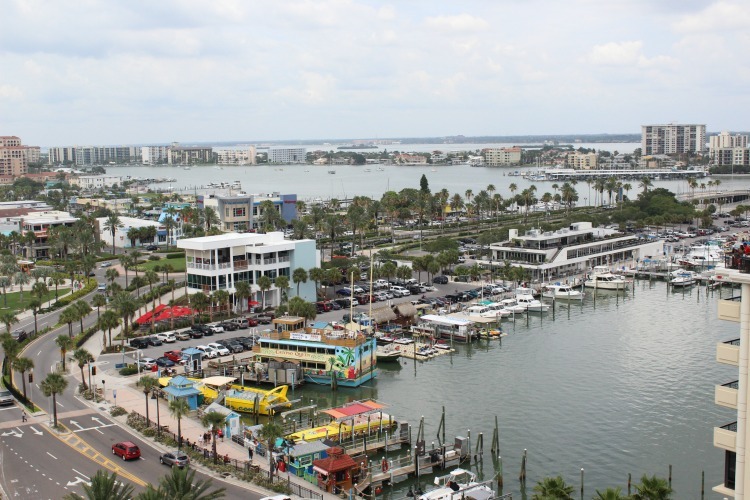 When my husband and I found ourselves kid-free while the girls were at my parent’s house, we decided to take a couple of days and head to Clearwater, Florida. Just a short drive from Tampa, it’s a gorgeous beach town on the Gulf Of Mexico. Since it’s only an hour from our house, it seemed like the perfect choice. 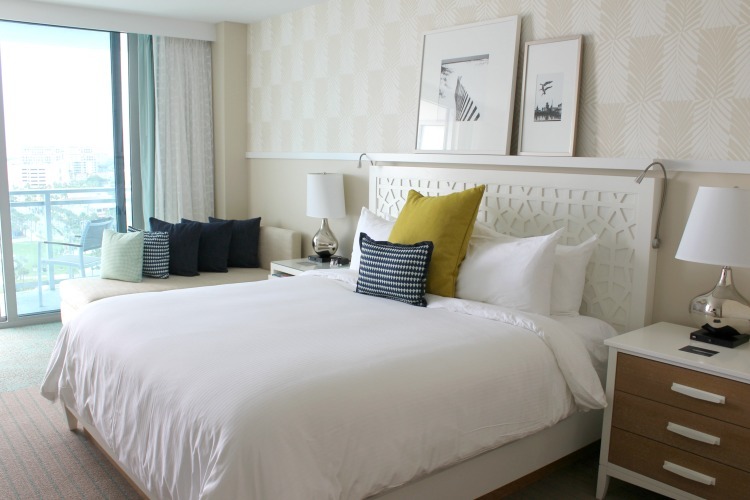 We planned to stay at the newly opened Wyndham Grand Clearwater Beach and I couldn’t wait to check it out. 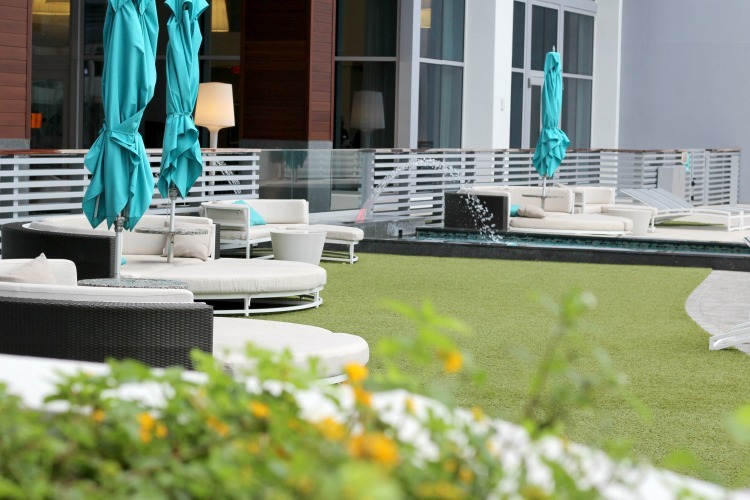 Having just opened in January, you couldn’t ask for a better location than the Wyndham Grand. It’s just across the street from the beach and walking distance to restaurants, boat tours and Pier 60, where you can catch the lively sunset celebration every night, weather permitting. If you’re flying, it’s just a 30-minute drive from Tampa. The rooms were decorated in a coastal style and the light decor made everything look elegant but inviting. 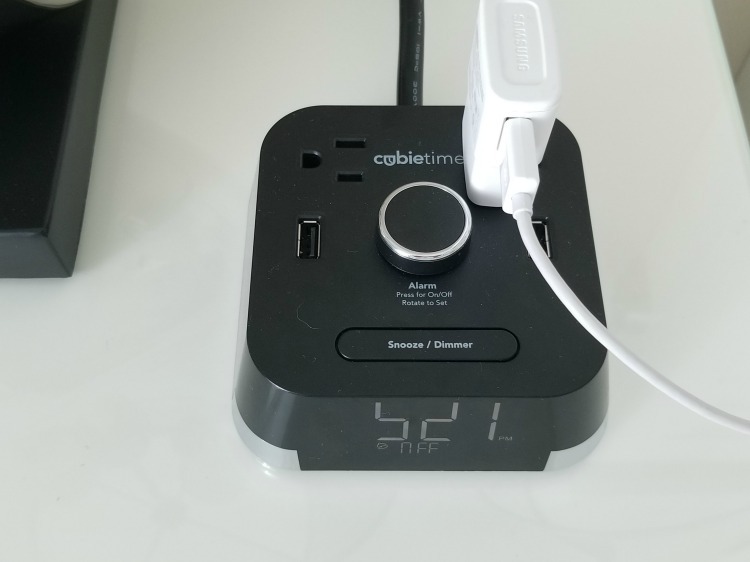 I couldn’t believe it when I saw an alarm clock with an outlet built right into it. It seems like every time I stay at a hotel, I have a hard time finding a spot to plug in my phone at night. Sometimes there’s not even one anywhere near the bed. When there is, I usually have to move a table to get to it, then pick and choose between the lamp and clock that are already plugged in. I seriously got excited when I saw that I could just plug my phone into the top of the clock. It’s the little things like this that make me happy! The other thing that made me happy was the amazing view. To our left, we looked over the beach and the Gulf of Mexico. To the right, we had a fantastic view of the bay. It doesn’t get much better than this! 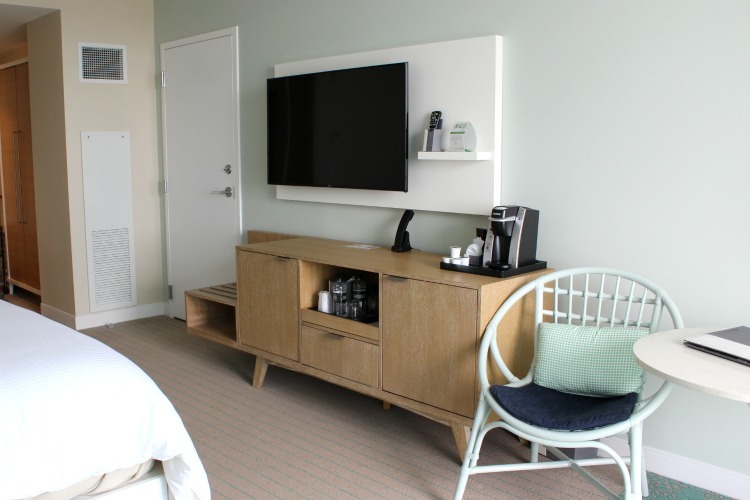 Room prices vary depending on the time of year you visit, but rates start at $250 a night. Keep in mind that there’s also a $25 per day resort fee, though I did find a deal on the Wyndham Grand website for $10 a day resort fees. Because there is no self-parking, you’ll also have to pay $25 per day for valet parking, though you can come and go as often as you’d like at no extra charge. The Wyndham Grand has several spots to visit if you get hungry. 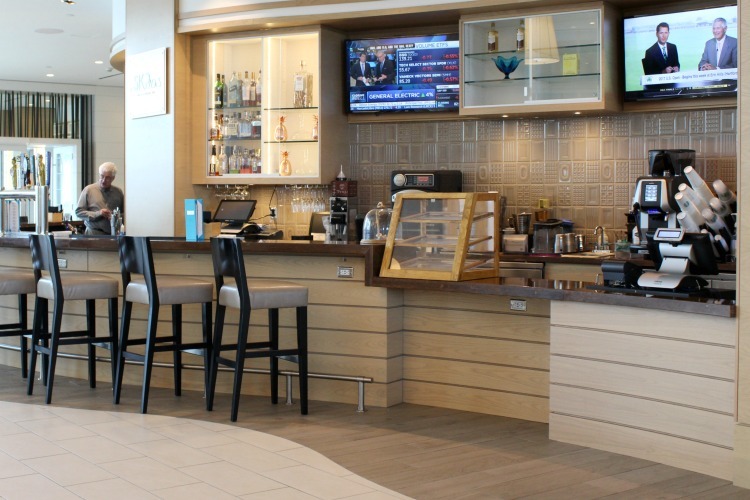 In the lobby, you can find a small dining area that doubles as a both a Starbucks in the morning and the hotel bar, Eskpades, at night. It was very convenient that I could swing by each morning for my favorite coffee. Stop in at night and you can order a glass of wine with small bites or sushi. TravelingMom Tip: If you’re planning on eggs or other breakfast food, you’ll have to order room service or go off property since the only food Eskpades serves in the morning are pastries. By the time I made it downstairs, there usually wasn’t much to choose from. 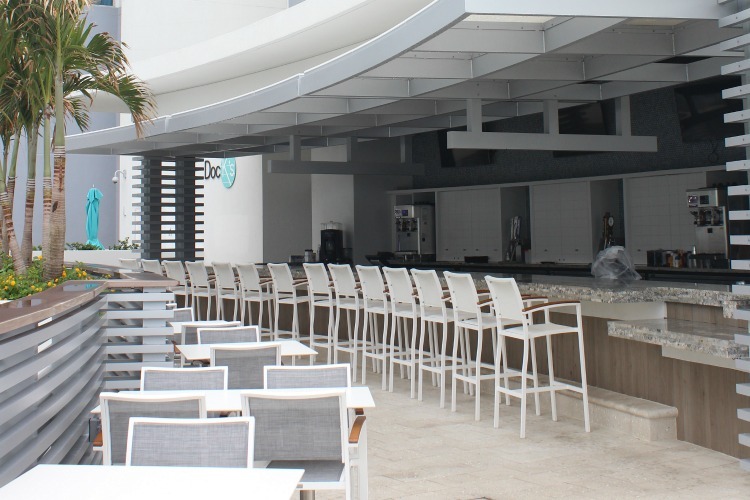 If you feel like having lunch poolside, Dock’s Pool Bar And Grill has both snacks and full meals. You can also order frozen cocktails or beer. You’re on vacation, right? It’s a scenic spot to enjoy a nice lunch since you are not just overlooking the pool, you’re looking out onto the ocean as well. 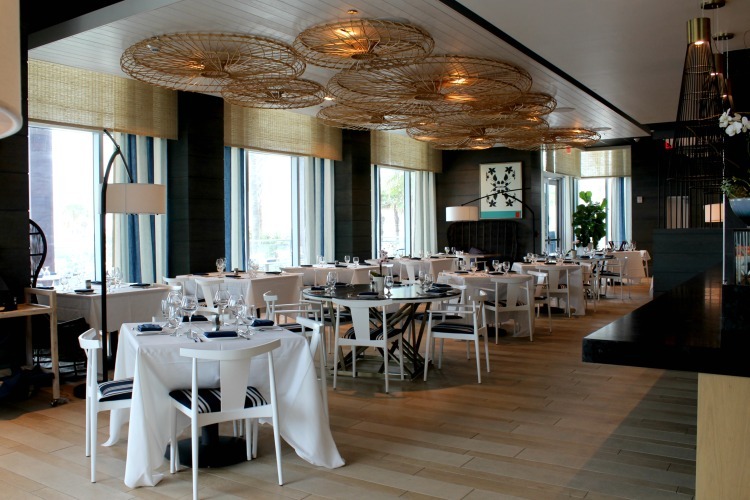 If you’re in the mood for fine dining, you should have dinner at Ocean Hai. With big windows overlooking the water, I recommend making reservations just before sunset. The Asian fusion menu includes everything from sushi to seafood, with steak, duck and even vegetarian dishes to choose from. We absolutely loved our meal! After the waitress hit a home run with my cocktail, I went with her recommendations for the remainder of the night. From start to finish, everything she selected for me was absolutely delicious, including the creme brulee that finished off our meal. 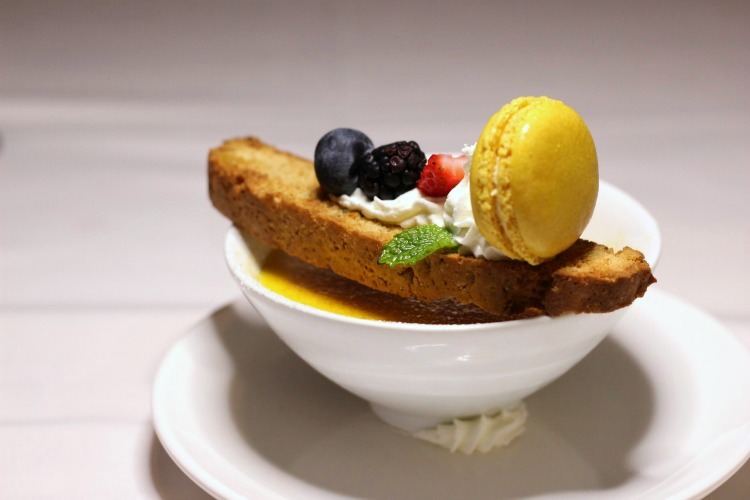 For a more in depth review of Ocean Hai, check out 5 Of the Best Places To Eat In Clearwater. TravelingMom Tip: This is not the kind of restaurant I would bring young children, so if you’re vacationing with kids, you might want to visit a more casual restaurant and save Ocean Hai for a kid-free getaway. The Wyndham Grand has a beautiful pool overlooking the ocean. It was kid friendly, heated (though heat wasn’t necessary in the middle of June) and had a jacuzzi as well. There were plenty of chairs and my favorites were the round bed-like chairs in the back area. It was the perfect spot to relax and enjoy a cocktail from the pool bar. 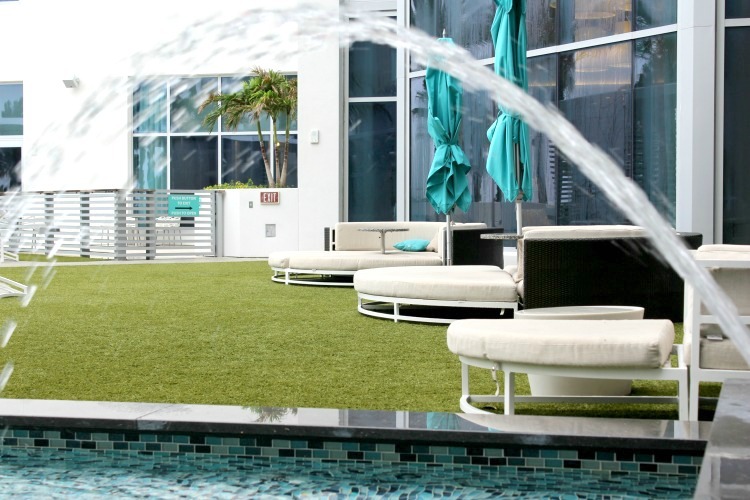 Other amenities include a spa, fitness center, event facilities and more. Now through September 3, 2018, select Wyndham Grand Hotels are offering the Reconnected Family Experience. 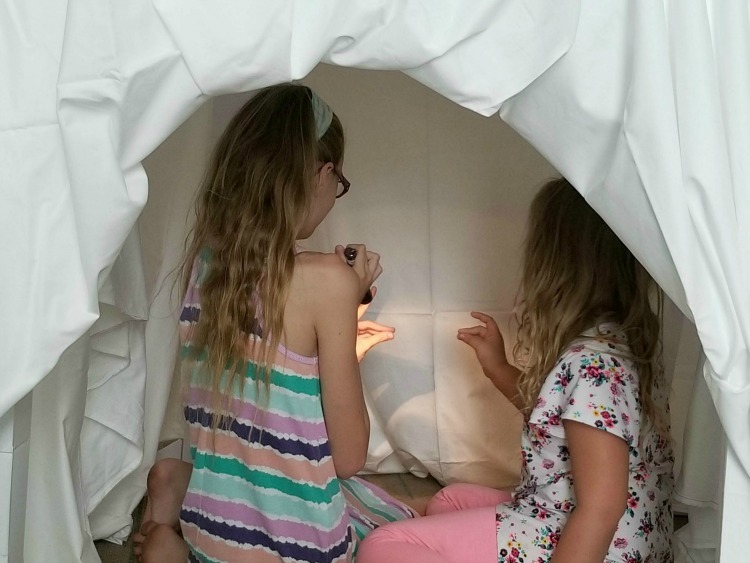 This experience encourages families to put away the electronics and focus on enjoying quality time together. My girls and I visited recently to experience it for ourselves. They were very excited when they found an Adventure Pack waiting for them in the room. *The experience includes one Adventure pack per child, for up to two children, though additional packs are available for purchase. 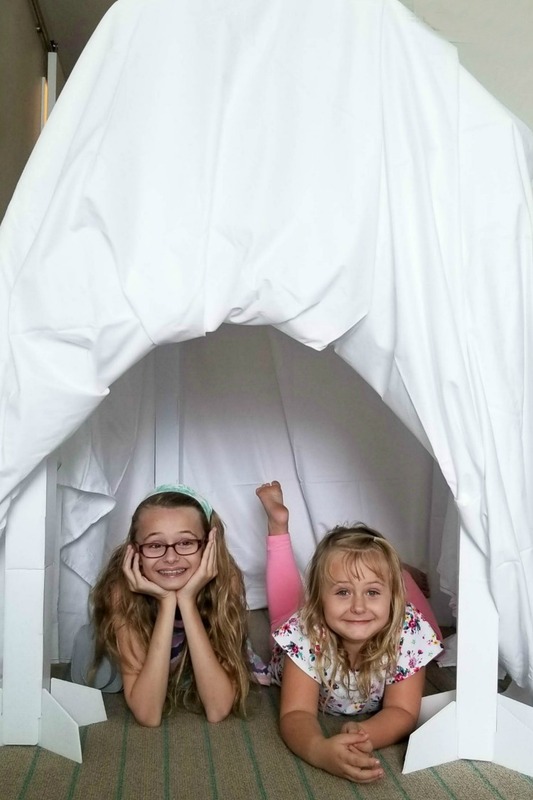 The first thing the girls wanted to do was build their fort. There were three themes to choose from, a cave, a castle or a school and we went for the cave. This fort was definitely fancier than the one’s we make at home! Next, we grabbed the flashlight to create some fun shadow puppets. We went out and about for awhile and as soon as we returned, the girls went straight back to the fort! My youngest loved it so much that she actually slept in it that night. The Adventure Pack was clearly a hit. One thing I really liked about this idea was that even when my phone wasn’t in the lockbox, I was much more conscious about keeping it put away and focusing on our family time. We thoroughly enjoyed our experience and made some great memories. Want to learn more? 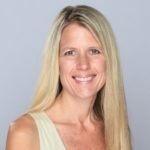 Check out my full review of the Reconnected Family Experience. A small number of rooms do not have baths. If this is important to you, be sure to ask about it ahead of time. Having a balcony might be worrisome for some parents of small children. This is a luxury hotel so it may not be the right choice for families on a budget. Between the views, the food and proximity to everything, we absolutely loved this hotel. The staff was friendly and helpful and the hotel offered everything we could possibly need. 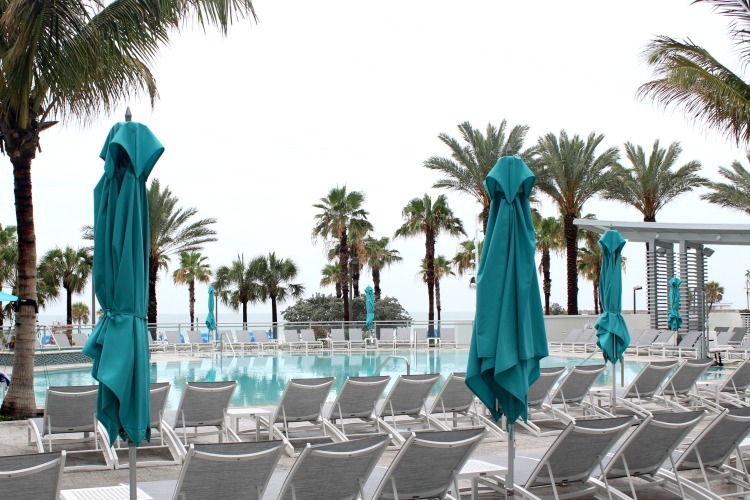 If you’re heading to Clearwater, Florida and want to spoil yourself a little, you’ll definitely want to check out the Wyndham Grand Clearwater Beach.